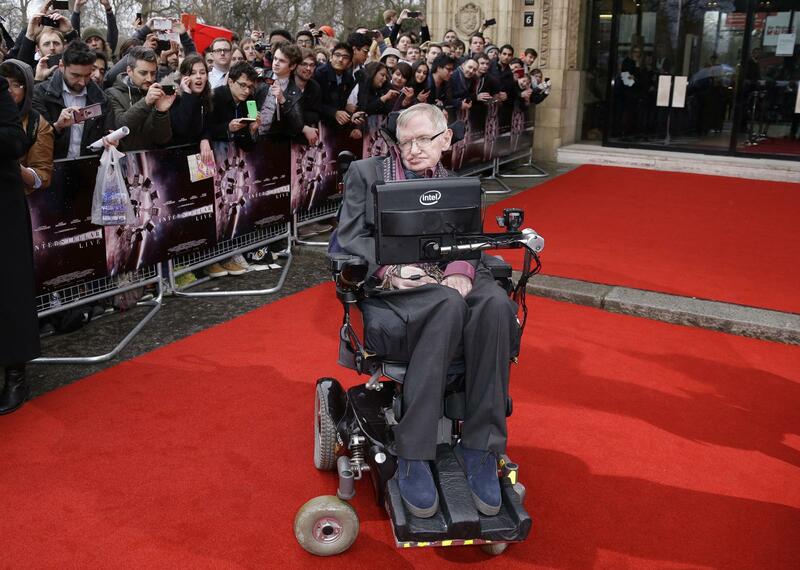 Photo Associated Press: Professor Stephen Hawking poses for photographers upon arrival for the Interstellar Live show at the Royal Albert Hall in central London, Monday, 30 March, 2015. Christopher Nolan’s film will be shown on the big screen, whilst composer Hans Zimmer leads a 60-piece orchestra and the Hall’s Grand Organ in a simultaneous performance of the movie’s Academy and BAFTA nominated score. The world’s most famous scientist, Stephan Hawking will make an appearance at Glastonbury Festival, Somerset, England. Professor Hawking will appear at the festival’s Kids Field that will be held this year in June. The festivals official website has announced that Stephan Hawking will make “a special guest appearance” specifically designed for children age 12 and under.Children under age of 12 will have free entry to the Glastonbury festival. The festival didn’t provide any details about Stephan Hawking’s role at the festival. Will he perform his Monty Python cover or he will simply exchange ideas with kids about black holes and stars? The amazing line up for the festival includes big names such as TheWho, Foo Fighters, Kanye West, Lionel Richie, Pharrell Williams, Mary J. Blige and many others. Stephan Hawking was diagnosed with amyotrophic lateral sclerosis (ALS) in 1964 at the age of 22. Despite his condition, he developed theories about universe and he is distinguished as one of the most brilliant minds of modern age. The festival will be held from June 24 until June 28 at Worthy Farm near Pilton, England.